Open Source, by M.M. Frick. What if a ship carrying stolen Russian missiles bound for Iran was mysteriously hijacked? What if Israel was secretly behind the hijacking? What if the guy who fills the vending machines in the office break room figured the whole thing out? Based on true events, this thriller featuring a savvy Everyman blogger barrels to “a breathless conclusion.” Highly recommended for fans of Barry Eisler’s “John Rain” series of thrillers. Read review. Stranger: A Death Valley Mystery, by Melissa Garcia: “You can taste the dust and feel the prickle of desert heat” in this story about what happens when an ex-con and her brother flee Los Angeles for a new start in the small, gritty town of Lake City, Nevada — only to run into a gang-banger’s dead corpse and secrets galore. Read review. Neptune’s Chariot, by Irv Sternberg: A “rollicking, retro seafaring adventure” set circa 1855 involving a highborn woman who stows away on a ship headed around Cape Horn. Written with the “innocence of tales like Treasure Island,” notes our critic, without the “ramrod straightforwardness of Patrick O’Brian.” Read review. Impure: Resurrection, by J.R. Bailey: Imprisoned for 16 years, young necromancer Koristad Altessor, now freed, sets out to avenge the death of his family at the hands of a ruthless usurper called the Vampire King. Powered by an intriguing and complex antihero, richly described realm-building and relentless pacing, this book, says our critic, is “simply unputdownable.” Read review. 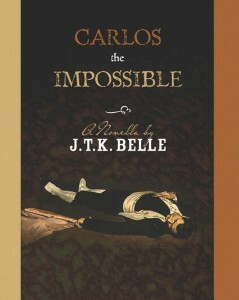 Carlos the Impossible, by Jeffrey Belle: A matador determined to artfully dispatch a bull rumored to have killed dozens of men is gored and nearly killed by the bull. The matador then schedules a rematch…and another…and another, until the two lives are irrevocably intertwined. Writes our critic: “A resonant and confidently penned fable with a heart as big as its heroes.” Carlos earned a BlueInk Best Book Award, our highest honor. Read review. Mississippi Flyway, by Nel Rand: When Ellie reunites with her estranged father, Tiny Moon, a 300-pound gambler and eating contest champion, the result is a rollicking road trip down the Mississippi River flyway. As Ellie confronts suppressed memories, readers encounter a cast of quirky characters that fly off the page. “A powerful tale of redemption and forgiveness, as satisfying as it is thought provoking,” writes our critic. Read review. When the Jacaranda Petals Fall, by David Barnato: This novel that travels between Scotland and South Africa intertwines stories about the lives of a young South African man and the Scottish couple he comes to work for at a farm near Cape Town. Writes our critic: “…A quirky yet refreshing romp that plays out in continually changing points of view…a well-developed, intriguing and delightful first novel written in a unique voice.” Read review. Mneme’s Place: Book One, by Glenn P. Wolfe. A wildly inventive novel about the tricks of memory, the emotional tug of baseball, the neuroses of showbiz folk and the glories of language itself. Writes our critic: “There’s so much energy and wit (in this book)…that even its intermittent shortcomings – repetition and verbal excess — feel like blessings.” Note: the author, a Hollywood scriptwriter whose credits include Perry Mason, died before finishing the book. Read review. Leaving Brogado, by Marshall Harrison: Presented as a Marine’s memoir of his time in Vietnam, this novel has “the jaunty, knowing air of True Grit and the breezy intelligence of Catch-22.” Read review. The Coming Retirement Storm, by Robert Margetic: As current as a 2011 issue of Smart Money magazine, yet an instant classic, financial advisor Margetic’s book describes in sobering detail the “retirement storm” that is already upon us, with major changes expected in taxation, health care, Social Security, inflationary risk and investment security. The author offers guidance on how to weather that storm. Read review. Circuits and Bumps, by Philip Condon: With the “deft story-telling of Frank McCourt” and a “healthy dose of Julian Barnes’ wit,” Condon writes about his childhood, in which he was sent to live with strangers during the London Blitz, and his adventurous life thereafter, which included hitchhiking, gold mining, mountain climbing — and finally, settling down to teach. Read review. BlueInk Review is founded by Patti Thorn, former books editor of the Rocky Mountain News, and Patricia Moosbrugger, literary agent and subsidiary rights specialist. We offer serious, unbiased reviews of self-published books.